Wow, I went a whole week between posts. But it was a busy week with my day job, so there wasn’t much to say. Not that I could post about, anyway. I do have changes to report in my stash this week. I busted 10 yards for backing, and it is just barely going to be big enough for my top. I knew it would be close, but I really want to use this fabric for the back of this quilt. It’s flannel, so I think there may have been a bit more shrinkage than I might have had with a regular cotton. As you can see, it’s a real tight squeeze on the sides. I have plenty extra the other direction, though. I will make it work! I also ordered 8 yards for a one block wonder class I’m taking next month, for quilt guild. I tried my best to find something suitable in my stash, but the only two that I thought would work, I did not have enough yardage. So I had to order some. It will arrive some time this week, but I’m going to go ahead and count it as incoming today. So here’s my yearly totals. Incoming Yardage to date: 8 yds. Outgoing Yardage to date: 30.5 yds. Total Stash Busted to date: 22.5 yds. 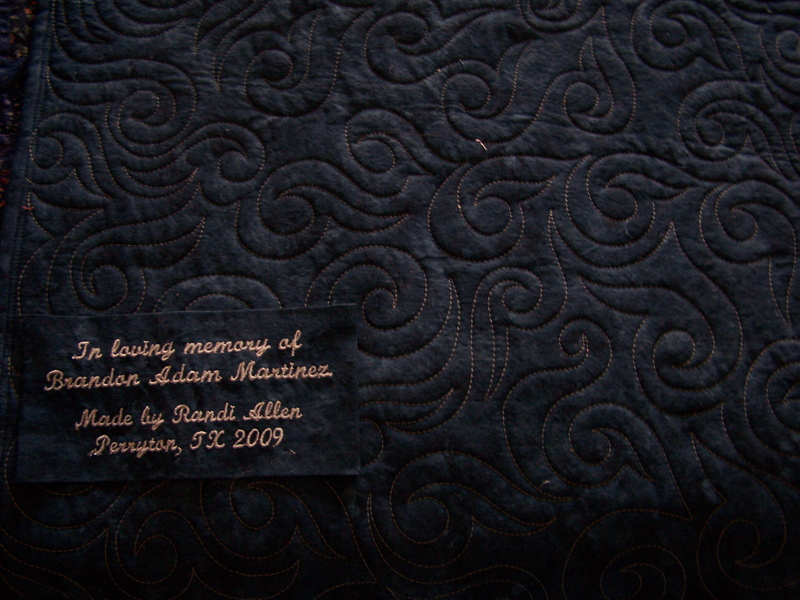 I also finished the binding on the memorial t-shirt quilt, and made the label. I just have to attach the label and it will be completely finished. 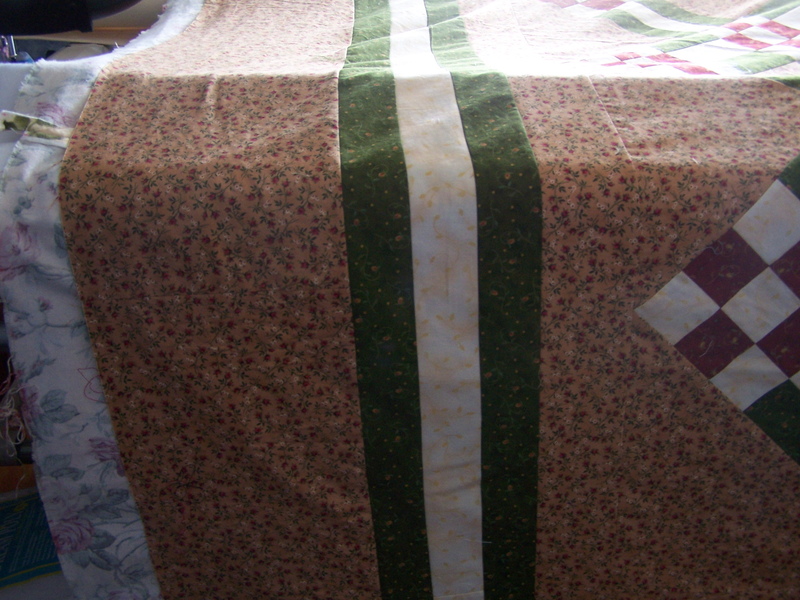 I was able to use some of the scraps from the first quilt, made of his plaid cotton shirts, in the back of this one. I also made some good progress on one of my stash quilts today. My Boston Commons top. 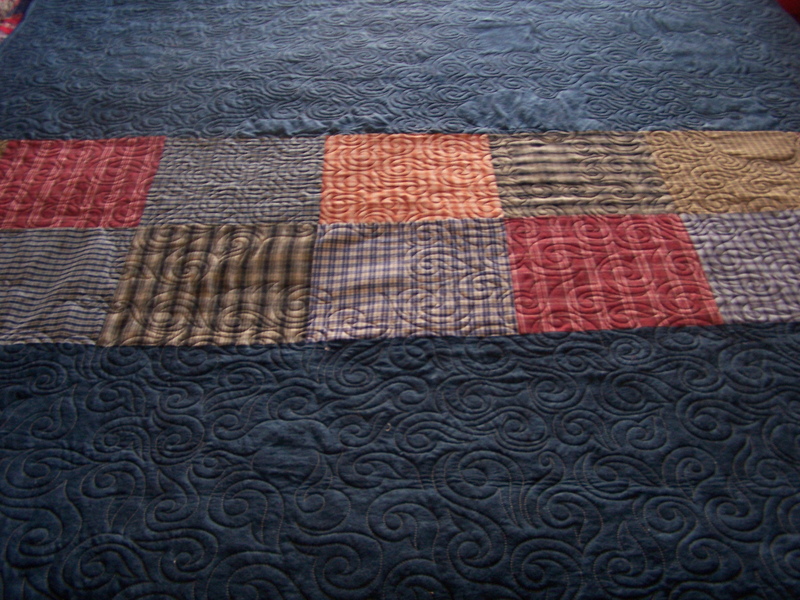 Now, I have to decide how I want to quilt my 9P & stripe, that I made the backing for. 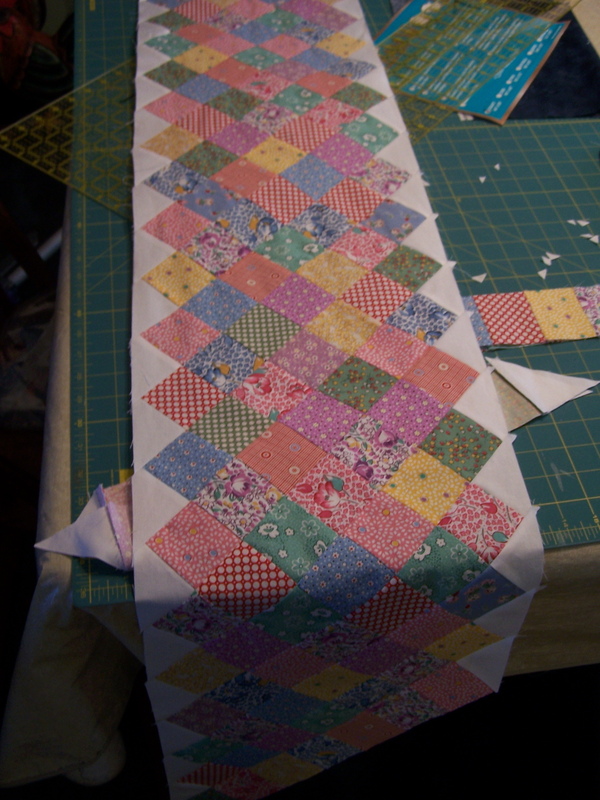 It is going on the longarm next! And it’s MINE! Yay! Have a great week! Try to find time for something you love to do! What gorgeous quilting on that t-shirt quilt! i made a boston commons once out of 30’s fabrics too. love it. Wow! Such nice work, Randi. 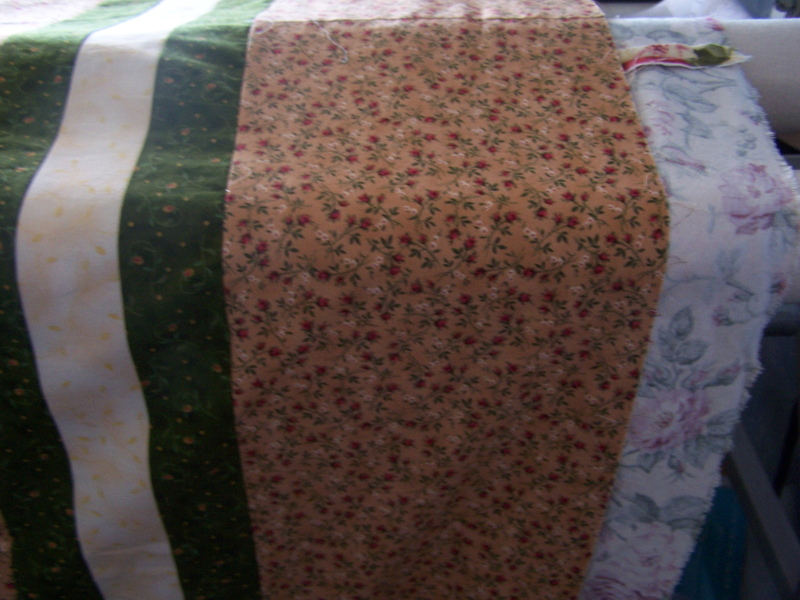 Both quilting and piecing. And 8 yds in for the stash?? Hec’s pup … I bought more than that for dog collars for pete’s sake! Too bad I can’t attach a pic for you to see the collars … they are good stuff. Sorry … that “submit” came too soon. I really like the label you made for the t-shirt quilt. Simple and touching. Your boston common is just great. I’m not much of one for 30s fabric, but I really like your choices for this. The 9Patch and Stripe is gonna be delicious! Can’t wait to see it quilted. Randi, really nice job on the t-shirt quilt. I know the recipients will be very pleased. I love the quilting on the t-shirt quilt. Like everyone else said, I love the quilting on that Tshirt quilt! I’ve made two small ones and yours just rocks! WOW it’s well laid out, quilted and love the label too. Thanks for sharing these treasures for sure! Hi friend, hope things are going well for you. Looks like you’re making fabulous progress on your projects. Just popped in to say great quilting and to wish you a very Happy Birthday! I love the Boston Commons quil t- so pretty. The T-Shirt quilt is something I need to think of making for DD with all those great saying Ts she doesn’t want to get rid of but are too small. Randi, they are all beautiful! 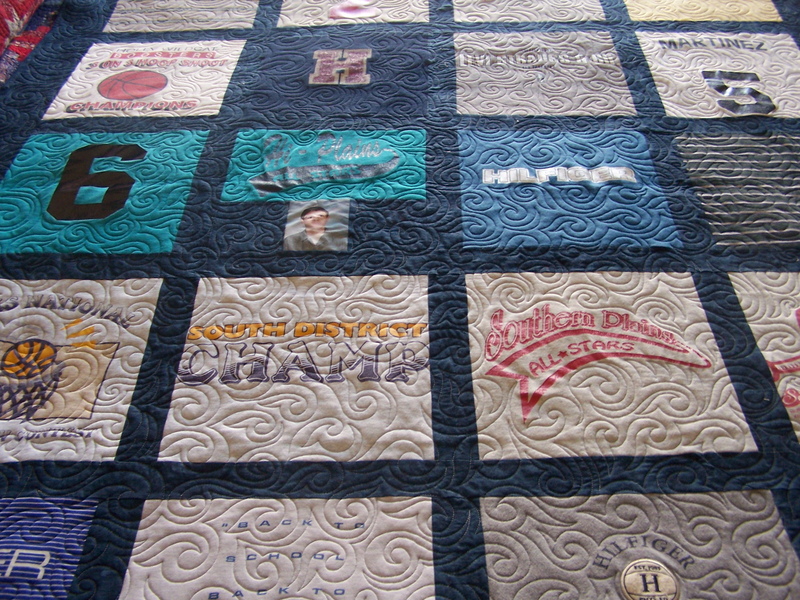 I love the way you quilted the memorial t-shirt quilt — very effective! Lovely work — your quilting is always so nicely done. I enjoyed reading up on your projects! It’s lovely to hear from you again!